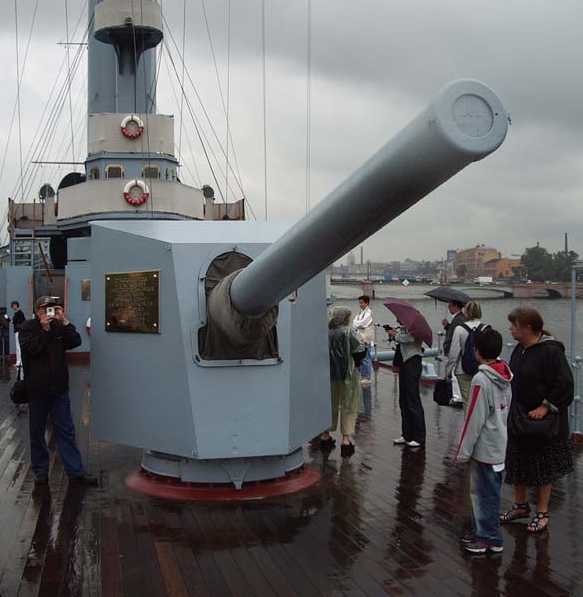 6"/45 (15.2 cm) Pattern 1892 gun on Protected Cruiser Avrora (Aurora), St. Petersburg, Russia. Photograph copyrighted by Vladimir Yakubov. This gun was manufactured in France in the early 1890's by the French designer Canet. Together with a 12 cm/45 (4.7") gun, it was shown to a Russian delegation in 1891. By using fixed ammunition, the French were able to achieve an amazing rate of fire of 12 rpm for the 12 cm/45 and 10 rpm for the 6"/45 (15.2 cm). A license was quickly purchased and production in Russia began in 1892 at the Obukhov factory. Between 1897 and 1901 some 219 of the 6" (15.2 cm) guns were built. During the Russo-Japanese war several of these guns suffered burst barrels which resulted in a post-war redesign to strengthen the barrels. Between 1909 and 1916 an additional 304 guns were built to this new design. 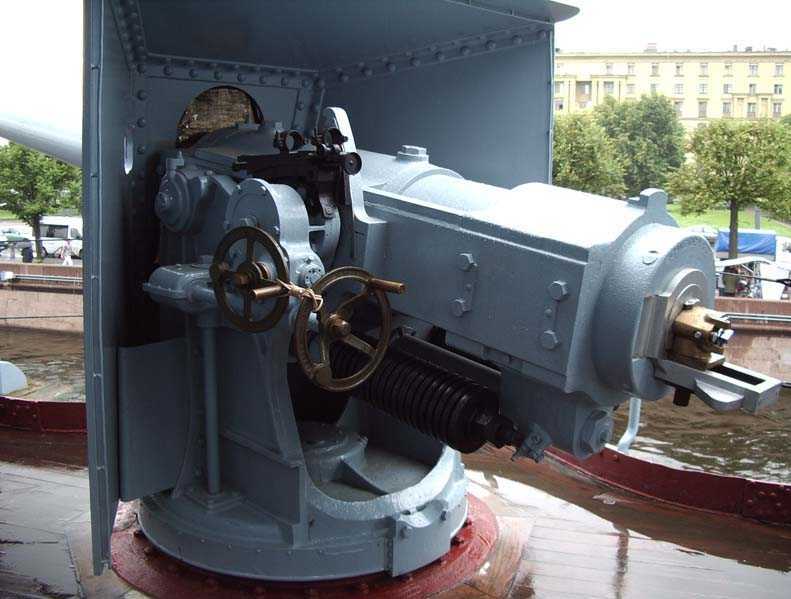 These were actively used in both World War I and the Russian Civil war as ship guns, coastal defense guns, rail road guns and as the armament for river craft and armored trains. In 1941 there were still 196 guns of this type in the Soviet Navy (82 in the Baltic, 70 in the Pacific, 37 in the Black sea and 7 in the Northern fleet). Some 100 guns of this type remained in Finnish hands after independence in 1917, most of them in the former Russian coastal fortresses of the Peter the Great Maritime Fortress System built around 1912-17 to protect St. Petersburg. The Finns modified the guns by turning them upside down and thus putting the recoil system on top, a change which substantially increased their maximum elevation and consequently the range. In the 1950s, these guns were modernized and given new 50 caliber barrels which were manufactured by the Tampella Company, the type code being changed from 152/45 C to 152/50 T. Muzzle brakes were also installed. At the same time, the guns were changed from using bagged charges to using cartridge cases and new shell models were developed. As originally finished, these guns were furnished with a naval-type shield that was open at the back or given no shield at all. During the 1960s, the guns were given a full cupola of relatively thin plate intended to provide protection against napalm and shrapnel. In this form, the guns formed the heavy artillery of Finnish coastal fortifications well into the 1980's, when they were superseded by a new-construction auto-loading 130 mm (5.1") gun in a power-driven armored turret with computer-controlled gunlaying (the 130 53 TK). These are now being phased out in favor of mobile anti-ship missiles. Actual bore diameter was 152.4 mm (6.0"). Data from "Gangut" Issue 7 article for these guns vs. KC-type Armor. 6"/45 (15.2 cm) Pattern 1892 bow gun on Protected Cruiser Avrora (Aurora), St. Petersburg, Russia. Photograph copyrighted by Vladimir Yakubov. 6"/45 (15.2 cm) Pattern 1892 in ship-deck mounting. Twin 6" (15.2 cm) turrets on Battleship Tsesarevich about 1900. 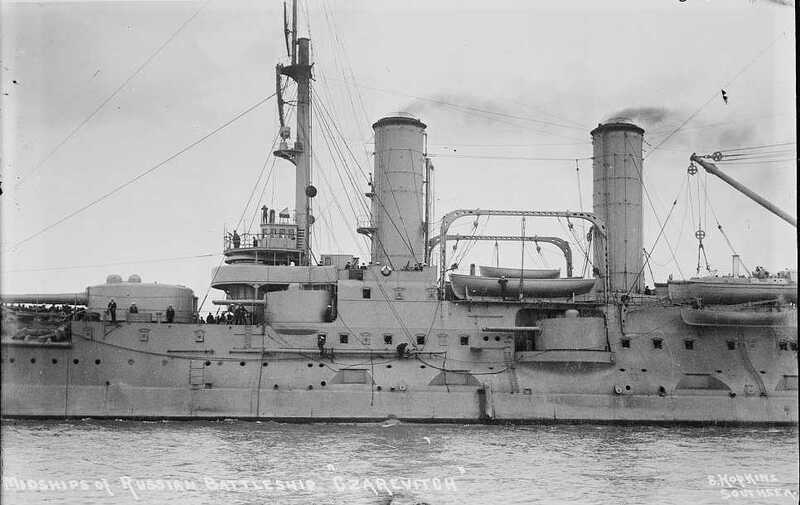 Caption reads "Midships of Russian battleship Czarevitch". Bain News Service Photograph. Library of Congress Photograph ID LC-DIG-ggbain-16925.